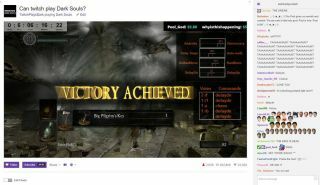 I've covered a couple of boss fights in the Twitch Plays Dark Souls playthrough, but stopped after the Capra Demon. If thousands can collaboratively kill the Capra Demon then the Iron Golem and Quelaag aren't going to present a huge problem. Ornstein and Smough on the otherhand... if there's an encounter that can stop Twitch Plays Dark Souls in its tracks, then it'd have to be the one with these nasty oafs. Twitch prevailed though, as you can see in the above video. It's worth mentioning again, in case you're new to this playthrough, that TPD is using a turn-based system, which allows time for the community to reach a consensus on the next move before the game kicks into gear again. So it's not realtime, but it's still damned impressive. More impressive still is that they managed to get past those bloody snipers in Anor Londo. I lift my glass to you all. Thanks to YouTuber whydoyoubark for the video, and for editing out the pauses.